A fun read, but certainly not a traditional biography. If you are looking for a straight storyline with a clear start and end, you may be in for a surprise if you pick up this book. In general, this book is pieced together by segments and articles, as if the author is developing a portrait of a person instead of a life story told in the tradional, narrative storyline. With that said, the life of Jorgy is interesting, and this book is worth a look. As the 50th anniversary of statehood kicks off this week, we'll be hearing and reading a lot of takes on Alaskan history. "Jorgy" sets out to tell the story of an extraordinary pilot and along the way tells the history of Alaskan aviation. After reading "Jorgy," I have a hard time thinking of a more interesting perspective on state history than through the window of an early Native bush pilot. Wow, what an interesting man Captain "Jorgy" is. This was an interesting book for me, in that it is the first biography that I've read that is essentially an edited transcript of the words spoken aloud by the subject, telling his own story. Thundering applause for Jean Lester for keeping it this way rather than trying to turn this into a "normal" biography. This way, it works. "Hearing" "Jorgy" tell his own story in his own words made this such an interesting read, that I encourage anyone interested in Aviation, Alaska, American History, oral history, or is just looking for a fun read to pick up this book. Jorgy was awarded this recognition in 2006, but I thought I'd put it online for the benefit of the curious. The Wright Brothers Master Pilot Award (Fairbanks Flight Standards District Office Honoree 2006) is awarded by the FAA. Other honorees include Randy Acord, Pearl Laska, Merrill and Richard Wien, and others. A biography of Jorgy is included on their website (PDF). A recommended book on Go By Jet! On the Alaska Airlines page of GoByJet.com Jorgy is listed in the sidebar as a recommended book! Word is getting around. Jorgy is now available at Mac's Fireweed Books, the first Canadian bookstore to carry his memoir. Mac's is in Whitehorse, Yukon Territory, and is an excellent store. As they say, it "is a proud, independent bookstore and a Whitehorse institution." If you're up that way, check them out. • Book signing at the Alaska Aviation Heritage Museum starting at noon and going on until 3 or 4 pm, June 20, Friday, 4721 Aircraft Drive, Anchorage. • Book signing at Title Wave Books at their downtown store, 415 W 5th Avenue, from 3:30 to 5:30 pm, June 21, Saturday, Anchorage. • Book signing at the Fairbanks Barnes & Noble, at 421 Mehar Avenue, Sunday, June 29 (time to be announced), 2 to 4 pm. • 2008 Salmon Bake at the Alaska Aviation Heritage Museum, on July 4th, Friday from 4 to 9 pm, Anchorage. Jorgy's book is now available in Nome, at the Arctic Trading Post! This book is an oral autobiography, so I suspended my usual demands on structure and approached the stories in this book as if I were a small child listening grownups talk about days gone by. And I was well rewarded. The subject of this book is Holger “Jorgy” Jorgensen, whose heritage includes Russian, Inupiat, and Norwegian ancestors. 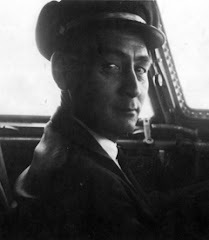 His life began with a subsistence-level struggle for survival and grew to be part of the story of aviation in Alaska. In 1943…Jorgy started flying lessons and he never looked back. He flew as a charter pilot, an airline pilot, a freight pilot, and for the sheer love of flying itself. He criss-crossed Alaska, landing on icebergs, too-short runways, and runways ending beside mountains. He progressed to flying jets and piloted planes carrying passengers and freight around the world. I can see how Jean Lester, who brought this book to life, must have sometimes wanted to beat her head against the wall. She describes Jorgy as a master of understatement, and editor Carla Helfferich describes him as “a laconic fellow with a good memory and no interest in tooting his own horn.” The stories are told in a dry, unemphatic way just as I might talk about a day at the office. However, Jorgy's day at the office included hauling the inanimate (dynamite and dump trucks) and animate (fish--dead, reindeer--live). And he did it in a place where you might have to drain the oil from an airplane's engine to keep it from freezing. The problem with reviewing this book is that I want to tell you all the things Jorgy did, and there are just too many of them. And then there are the very understated descriptions of what it was like to grow up as a native and have to catch or harvest every bite of food that went into your mouth. Plus there is the story (also understated) of how Jorgy faced down the attitudes toward natives and did his part to end segregation in Alaska. The natural audience for this book is pilots, but non-pilots will find a lot here, too. I'm not a pilot and I found much about this book to be fascinating. I only wish I could have really been listening while Jorgy told his stories. More speaking or signing events are coming up, some of which will, we hope, be in Anchorage. Please check back for more news. Any readers who may have stories to share, please post them in the comments! The talk at Noel Wien Library went well; Jorgy, Jean, and I dressed up, Melinda came all spiffied up (with a little airplane pin on her black velvet lapel), and around 62 people attended the talk, with a few more coming in afterward for the book signing. Richard and Sally Wien came, and Richard introduced Jorgy with the tale of giving him a check ride when Richard was 17 years old. After the talk, people asked questions about things like the FAA, Jorgy's flight to the T-3 ice island research station, going to countries in Asia and Africa, whether he preferred large to small planes, his first flight, seeing his first airplane, and so on. It was a good turnout, and interesting. Jorgy Jorgensen is definitely a remarkable individual who overcame long odds to rise to a well respected position in his chosen profession. The book conveys his laconic voice well although, to some extent, it is a victim of his accomplishments in that, even when Jorgy's not bragging, the book seems to be. The book holds obvious appeal for fans of aviation and those interested in the behind the scenes stories of the Alaska bush. While I am neither of those, the book held my interest quite well too. There are two upcoming events at which you can meet Holger Jorgensen and get a copy of his book. The first is a book signing at Gulliver's, Saturday, May 17, from 2 to 4 (and probably a bit later). The second is a talk on aviation and his life at Noel Wien Library, Wednesday, May 21, at 7 pm. Jorgy will give an overview and perhaps an anecdote or two, and he and Jean Lester will be available for questions and book signing afterward. Jean Lester has collected many, many hours of tapes over the two years or so worth of interviews with Jorgy, and intends to donate these the UAF Polar Regions Oral History collections. Jean Lester, Jorgy, Noel Jorgensen, Melinda Harris, and Deirdre Helfferich (publisher) went to the 2008 Alaska Airmen's trade show, held May 3 & 4, Saturday and today, in the Fed Ex hangar at the Anchorage International Airport. We'd apparently just missed the deadline for getting into the program, so people didn't know we were there at first--but friends and acquaintances of Jorgy's soon found out and several hundred of them came to wish him well and buy his book. It was (to put it informally) a blast. There were, of course, a ton of pilots, and old friends even from Haycock came by to say hello. A few aviation stores in the Anchorage area now carry Jorgy as a result of contacts made at this conference: the Alaska Aviation Heritage Museum, the Lake Hood Pilot Shoppe, and Northern Lights Avionics. So, if you live in Anchorage but missed Jorgy's booth at the trade show, or were unable to make it to the event, you can get it at one of these places, or at Title Wave. I was very pleased with this book. The cover is attractive and the size of the book is comfortable, as well as allowing the print to be comfortably readable. It included a great map illustration which made Jorgy’s travels come alive. Many photos, interesting captions and quotes from those who knew him, as well as an informative glossary and appendix made for a fuller picture of this man’s life. Having interviewed the elderly to try to write their memories down, I know how difficult it can be to get them to talk about themselves, that is why the notes from those who worked with and knew Holger Jorgensen are so helpful. Jean Lester did a good job of capturing Jorgy’s calm, dry, no-nonsense style of speaking and his quiet humor. Aviation fans would probably enjoy this book even more than I did; it is filled with details of the flights and planes used in the bush of Alaska in the 30’s, 40’s, 50’s and 60’s. It also tells much of the life of survival in Alaska villages in those years. There are many interesting anecdotes which made it an easy read. Holger faced and overcame tragedy, prejudice and hardship. He quietly, or not so quietly, did what was right and did his best. It is uplifting to read about such a man, and I felt by the end of this book that I had met a fine specimen of the human race. 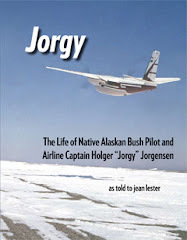 I sailed through this thoroughly enjoyable and well-told story of the life of native Alaskan bush pilot Holger Jorgensen, as told to Jean Lester. His description of Alaska and village life when he was growing up in the 1930s and 40s is fascinating by itself. Jorgensen describes his ascent through the ranks as a pilot, along with the discrimination he faced as a native. He also tells how the training, guidance and equal treatment he received from those who saw him only as a pilot - not a native pilot - helped him to achieve his goal to be the best pilot he could. I found the descriptions of flights, airports (or sometimes just spots to land) and piloting strategies and techniques to be particularly instructive, even if I never fly in Alaska. This is a handsome book, with photographs and a nice format. At the moment, there are several options. You can order directly from the publisher or order through Alaska bookstores like Gulliver's Books, Title Wave, or the UAF Bookstore. You can also order on line through Amazon, or, if you are looking for a distributor for this title for your bookstore, you can contact Partners West Book Distribution. And, of course, it is going to be available at the Alaska Airmen's Association conference, the Valdez Fly-In, and other aviation events! The book retails for $25 and is a paperback, with many photos, appendices, and an index. From Men of the Tundra: Alaska Eskimos at War, by Muktuk Marston, comes a listing on Alaskool of photos, including one of Jorgy. You have to scroll most of the way down the page. The first two boxes of the book have arrived (just yesterday) and the first batch of review copies of Jorgy have gone out! Review copies will be going to newspapers and magazines around the state, including small newspapers in towns where Jorgy had regular flights, or which are discussed in the book. These include places like Nome, Kotzebue, Bethel, and elsewhere. The books are on their way! The books shipped today from the printer. Half will be drop shipped to Anchorage, just in time for the aviation conference, and the other half will come up to Fairbanks. The annual Alaska Airmen's Convention and trade show is a huge aviation show and get-together in Alaska. Jorgy Jorgensen, Jean Lester, and the publisher will have a table at this event -- along with Jorgy's memoir! Come see us there!